A musty odor in your home or mold in your crawl space are signs of a moisture problem. Woodford Bros., Inc. can fix your damp crawl space with an ENERGY STAR-rated dehumidifier or ventilation fan. If you're experiencing mold, buckling floors, termites, or rising utility costs caused by issues in your crawl space, Woodford Bros., Inc. can help. We specialize in crawl space repair solutions, and we know what it takes to prevent humid air and excess moisture from damaging your home. Call us today at 1-855-203-6835 or contact us online to get a free estimate on crawl space dehumidifier installation. 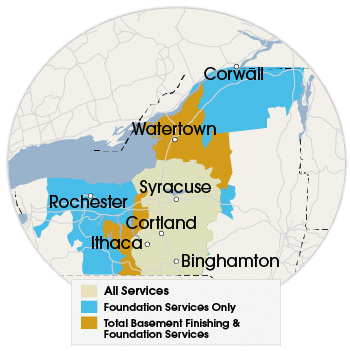 We provide our crawl space encapsulation and repair services in Syracuse, Binghamton, Utica, Rochester and surrounding areas in New York.